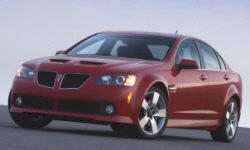 Why the 2009 Pontiac G8? The G8 is composed and responsive; the grip is extremely sticky for a large sedan. The balance between ride smoothness and performance is just about perfect. The skidpad numbers are around 86gs - It does what you tell it to do without hesitation. It is aggressive and sleek with a powerful stance. The bodylines are very attractive, the rake angle from rear to front is much more extreme than other sedans. The 19 inch wheels are flattering and not overbearing. The car often receives much kudos. Starlingly fast for a large sedan. Very smooth power delivery, lots of torgue throughout the powerband. The torque and power continue at highway speeds. Has 2 shift modes + manu-matic shifting. Power display creates much dismay for foreign sedan owners. Stops rapidly and without fanfare. Braking numbers have tested well. Takes a lot of extreme stops to create fades. Brakes are large, brembo-style stompers. Why Not the 2009 Pontiac G8? Audio controls are odd, but modern and attractive. System has great possibilities. Speakers are not very good. Power is okay. No navigation option as of yet. With decent aftermarket speakers, the system sounds light-years better. Is very low in stop-and-go traffic. Gets better with time, I understand. Dealers are sneaky sons of guns. You need to have eyes in the back of your head for many American dealers, it seems. Service has been good, though. Insurance has been very low for a new, powerful sports sedan. Depreciation is not very good, for whatever reason. See TrueDelta's information for all Pontiac models.